I could probably dedicate an entire blog to the stellar wardrobe of Sam “Ace” Rothstein. It’s no coincidence either; clothes were very important to the real life Frank “Lefty” Rosenthal, and Martin Scorsese invested at least $1 million of the film’s budget into costuming alone. Robert De Niro wore a staggering 70 different costumes over the course of the nearly three hour movie, and Casino fans know that very little of Ace’s attire can be easily found out in the real world. In fact, De Niro’s costuming from Casino merited enough attention that Boston designer Ibraheem Youssef created a very eye-catching poster that reflects most of Ace’s suits and sport coats from the prologue through the final car bombing. Today’s entry looks at the third from final entry of that poster, set late in the film as Ace finally confronts his unfaithful wife, Ginger (Sharon Stone, who had around 40 costumes herself in Casino). This look is about as close to a seasonally appropriate fall outfit as Sam Rothstein will wear. Forget those comfy sweaters and flannel shirts you start rolling out in September, Ace just incorporates fall colors into his loud silk and polyester numbers. In fact, this outfit only features two colors: orange and brown. The most prominent – and inimitable – part of the outfit is Ace’s burnt orange single-breasted jacket constructed from a shiny, textured polyester. The jacket has two brown horn buttons and a matching single button on each sleeve cuff. The padded shoulders have roped sleeveheads, and the two side vents rise high as was popular in the late 1970s. Ace goes through the stages of marital grief: stomach-turning worry followed by vengeful anger. At least he’s handling it better than Jake LaMotta did. One of the most distinctive aspects of Ace’s jacket are the angled lapel notches known as cran necker, fishmouth, or Parisian lapels. The latter two names make the most sense – the notches resemble the gaping mouth of a fish, and the design is Parisian in origin – but I have yet to discover the true meaning of “cran necker”. This type of lapel was featured several times on Ace’s jackets in Casino, but most notably on Don Corleone’s dinner jacket in The Godfather. Ace’s jacket has three square patch pockets – one on each hip and one on his left chest, where he wears a carefully and rakishly tri-folded orange silk handkerchief that perfectly matches his shirt and tie. Ace wears a shirt and tie only a shade lighter than his jacket that can best be described as “orange gold”. The silk shirt has a long point collar and the distinctive single-button tab cuffs developed by Ted Lapidus, the French fashion designer who popularized the “safari” look during the decade. Roger Moore had even worn Lapidus cuffs as James Bond in the late 1970s. I bet The De Niro Look even scares people over the phone. 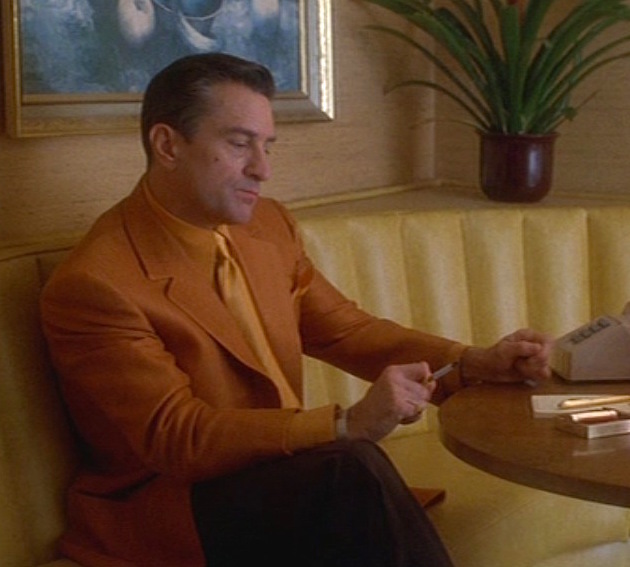 Ace’s orange silk necktie perfectly matches his shirt as they were both manufactured specifically for Robert De Niro by Anto. The cinematic Ace – if not also the real-life Lefty – was a strong proponent of matching his colored shirts and ties exactly, a trend that would be revived in the early 2000s by Regis Philbin on Who Wants to be a Millionaire? With such an eye-popping upper half, Ace keeps it relatively subtle below the belt. Or below the beltless waistband, more accurately. Although we can’t see much of his dark brown trousers, they likely have the same tab-front waistband and flat front as the rest of his pants. The straight-leg trousers have plain-hemmed bottoms. De Niro keeps it simple: orange on top, brown on bottom. Where it gets complicated is in the super ’70s details. Ace avoids an incorporation of orange into his footwear, sporting a pair of dark brown laced shoes with dark brown dress socks. The shoes are only briefly seen in one shot, but some color correction shows that they may actually be suede desert boots, which would fit the informality of the outfit as well as the setting and season of autumn in the Mojave Desert. Ace’s penchant for gold jewelry serves him well when keeping his color limited. His flat yellow gold wristwatch has a citrine orange-colored dial, which leads me to wonder if he really has a watch to match every outfit… and I wouldn’t put it past him, either. Ace wears a yellow gold pinky ring – also on his right hand, like the watch – with an emerald-cut citrine half bezel set in a geometric shank. I’m unsure if either of this jewelry came from Bvlgari, which certainly provided all of Ginger’s jewelry during the production. Ace and Ginger have an unpleasant fireside chat. For a better look at the costume itself, it was photographed here by Pete Smith (and featured below) at the Harry Ransom Center at The University of Texas at Austin. Ace often complains of stomach ulcers during the film, and his behavior during this scene makes it no surprise. Although he clearly works to combat his heartburn and digestive issues with Mylanta, his habit of continually chain-smoking Dunhill cigarettes can’t be doing him any favors, either. Cigarettes and antacids… Ace snacks like a champion. Ace’s costume, as photographed at the Harry Ransom Center at UT Austin. This is one of Ace’s outfits that probably wouldn’t work anywhere outside the context of 1970s Las Vegas. And this… this is how she backed him off.